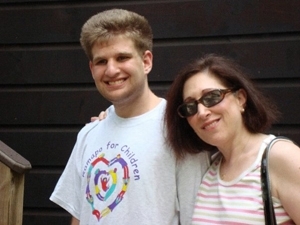 As part of our month-long series dedicated to Jewish Disability Awareness Month, Liane shares advice for those just starting out on the special needs journey. I’m a proud member of a tribe. No, not just that tribe. I mean the tribe of special needs parents. There’s no way you’d spot us in a crowd. But even without a secret handshake, special needs parents manage to find each other. Maybe it’s that unmistakable look of exhaustion and resolve many of us wear. Whatever it is, I’ve been part of this particular tribe for 20 years. Even after all this time, I still sometimes stop myself and ask, “How in the world did I get here?” When my son was initially diagnosed with autism and epilepsy years ago, I didn’t know anyone else with a child like him. That was back in the dark ages, before the internet. There were no websites or blogs to turn to for information and support. There was so much I didn’t know, and so much I was desperate to learn; I could have used advice from a seasoned tribal elder. 1. You are the expert on your child. No one else. Not your child’s doctor, his teacher, his neurologist, and certainly not your Great Aunt Gussie who raised 10 kids of her own. Listen respectfully to them, but remember they are experts in their own spheres, not yours. All of them–therapists, family, friends–go home at the end of the day. You are in it for the long haul, and you know your child better than anyone. 2. You are parenting a person, not “treating” a cluster of “symptoms.” When your child is first diagnosed, you’re going to hear a lot about the deficits–all the things your child isn’t doing. Don’t lose sight of the fact that behind the “special needs” label there is the same wonderful child you had before the diagnosis, who needs your guidance and love. There’s a saying so popular in the autism community that it is practically a cliché: “Once you’ve met one person with autism, you’ve met one person with autism.” Your child is unique. Yes, you will get all caught up in searching out treatments and therapies, but please take the time to enjoy him right now, because he won’t be a child forever. Don’t let your fears of the future rob you of the pleasures of the present. 3. People will stare. This will eat at you in the beginning. It’s natural to feel uncomfortable, resentful, even mortified. It is also a natural instinct for people to look at anything that’s a little out of the ordinary. Your child’s quirky behaviors in public may draw attention, and what if they do? Stop worrying about it so much. Who cares what strangers think? And I can promise you this: you will learn to never, ever judge any other parent whose kid acts up in public. Eventually you will figure out how to handle people’s inappropriate questions. I’ll never forget how taken aback I was at a wedding 15 years ago when my husband’s uncle abruptly asked, “Is there any hope for your son?” Sometimes people may imply that you just aren’t trying hard enough. Or they will offer unsolicited advice, or press the latest miracle cure on you. Worst of all, they will talk about your child right in front of him. Don’t let them. And don’t you do it either. Your child may not be verbal (yet), but his ears are working just fine. 4. Take care of yourself. Really. I’m not talking about a trip to Canyon Ranch. A study released a couple of years ago found that autism moms have stress levels similar to combat soldiers. I know there’s nothing you wouldn’t do for your child, but you count too and you’re no good to anyone if you don’t stay healthy and strong. Physically and mentally. Medication is there for a reason. No, not for your child. For you. Don’t be afraid to ask for help if you need it. Because as all special needs parents know, we need to live forever. 5. You will meet some of the best people you never wanted to know. Other special needs parents will not only validate your feelings and prop you up, they’ll be your best source for information. They are the ones who really, really get it. Embrace those fellow travelers–they’re your lifeline. Especially the wise-cracking ones. Your sense of humor will save you. 6. You and your partner/spouse/significant other are a team. Your child has no one else who loves him more. No question, having a child with a disability is stressful, but it’s imperative that you work together. Feelings can run high; you may each react differently to the diagnosis, or disagree on treatment. Don’t focus on what might have been; focus on what you have together. Check in with each other frequently; keep talking about what you are feeling and experiencing. 7. Focus on your other children. When a child is diagnosed with a significant developmental problem, it affects the life of every single person in the family. It can be a big adjustment for siblings. Find ways–frequently–to give them your undivided attention. Let them express the full range of their feelings, in their own words. 8. There will be people who tell you that autism is a gift. Or that God singled you out to be a special needs parent for a reason. Don’t believe them. You weren’t singled out or chosen. What you are doing is rising to meet challenges, and simply doing what every good parent does: giving your child everything he needs to thrive. My son has many abilities and strengths; he can be warm and funny and empathetic; he has an amazing memory; he’s a whiz with video games. But I’m not going to lie: those early years with him were hard and scary. So is reaching the age of 20. His disability isn’t a gift. What is a gift is the joy he and his older brother bring to our lives. 9. Celebrate your child’s achievements, regardless of how they stack up against those of siblings, peers, relatives, fuzzy memories of your own youth, or dreams you may have had for your child before he was born. Because there will be many. We waited years to hear our son’s first sentence, and it was a gem: “Mommy, snuggle me.” Your child is going to surprise and delight you, and you will never take any of those hard-won milestones for granted. 10.You will learn with utter certainty what matters most. Parenting a child with special needs will teach you about patience. Humility. Determination. Resilience. Acceptance. You will love your precious, beautiful child more fiercely than you ever thought possible. This post is part of a joint series with Kveller & Matan during February’s Jewish Disability Awareness Month. Through advocacy, education and training opportunities Matan empowers the Jewish community to include children with special needs. For more information, visit their website.